This is the second release in a series of recordings of orchestral music by the Hungarian composer Ferenc Farkas (1905�2000). The music here highlights the characteristics that make his music so appealing: catchy tunes, transparent scoring, buoyant rhythms and a fondness for Baroque forms and folk-dances. Farkas followed the example of Respighi, his teacher, in adapting Baroque originals for modern performance and the results are just as attractive as his Ancient Airs and Dances and should prove as popular with listeners. The performers are the virtuosi of the Franz Liszt Chamber Orchestra of Budapest, joined by the dazzling young trumpeter L�szl� T�th in Farkas� Trumpet Concertino. 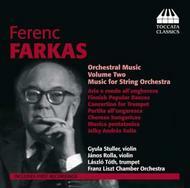 Two further CDs of orchestral music by Ferenc Farkas are in preparation from Toccata Classics, to be released over the course of the next two years.